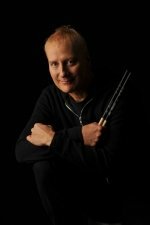 Gregg Bissonette has become known as one of the most versatile drummers in the business, his broad experience ranging from big band, blues, and rock, to Latin, fusion and much more. Gregg’s warm, easy-going down-to-earth manner is refreshing from one of the top drummers in the world. The Detroit native started playing on his dad’s drum kit from about the age of 5. At age 10, Gregg started taking private rudimental snare drum lessons with Bob Yarborough, a local teacher in Warren, Michigan. At age 15, Gregg won a scholarship to attend the Interlochen School of Music summer band program in Michigan. By this time, Gregg was performing professionally in and around Detroit with his dad’s band “The Buddy Blair Band”. Bissonette received his degree from North Texas State University (now known as University of North Texas) and soon after moved to Los Angeles. Bissonette has performed and recorded with a wide range of musicians and bands, including the Maynard Ferguson Big Band, Van Halen, The Buddy Rich Big Band, Joe Satriani, Toto, Don Henley, Spinal Tap, Carlos Santana, and is currently touring with Ringo Starr. He has also performed with Ringo Starr on The Tonite Show with Jay Leno, Conan O’Brian, Good Morning America, Regis and Kelly, and Last Call with Carson Daly. Bissonette has recorded and released two solo albums, Gregg Bissonette on Shrapnel Records and Submarine on Favored Nations Records. Today Gregg continues to record with and for many other artists, films and TV shows and tours nationally and internationally.